Prime Minister Justin Trudeau is surrounded by Amazon employees as he announces Amazon will be creating 3,000 jobs during a press conference on April 30, 2018 in Vancouver. Retail giant Amazon plans to create 3,000 new jobs in Vancouver as part of a complex that will be built in a former downtown Canada Post plant, a landmark building in a city that is pushing to be a high-tech hub. While Vancouver failed to make the shortlist of cities in the running to house Amazon.com’s second North American headquarters, the company says it will expand its work force in B.C.’s largest city to 5,000 in coming years from its current 1,000. Across Canada, Amazon now has 6,000 full-time jobs in B.C., Ontario and Quebec. 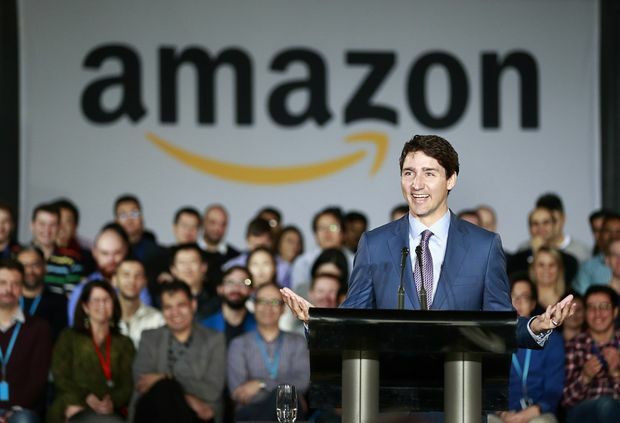 “We choose to build and grow in Canada because we recognize the diverse and exceptionally talented work force here,” Jesse Dougherty, Amazon’s general manager of web services, told an announcement event on the new development also attended by Prime Minister Justin Trudeau. He noted that Amazon has had considerable success recruiting and hiring Canadians – a mix of experienced coders, university graduates and people who have chosen to live and work in Canada. “As a homegrown British Columbian and a software engineer, I am so proud of living and working in a city that is recognized worldwide as a first-rate global tech hub,” Mr. Dougherty said. The plan announced on Monday will see Amazon expand into a 416,000-square-foot skyscraper being built into a Canada Post plant, which was opened in 1958 and designated as an historic site by Heritage Vancouver. It was sold in 2013. QuadReal Property Group, which is managing the redevelopment of the site, said in a statement that Amazon will occupy 35 per cent of the more than one million square feet of total office space in the renovated postal complex, which is across the street from the main branch of the Vancouver public library system. QuadReal said construction of the entire project will begin in January, 2019, and be completed in mid-2023. Workers in the new Amazon development will have corporate jobs focused on e-commerce technology, cloud computing and machine learning, Mr. Dougherty said. Vancouver Mayor Gregor Robertson said in an interview on Monday that Amazon did not receive any concessions from municipal governments to encourage the development. In making a pitch to house the second Amazon North American headquarters, Vancouver sold itself to Amazon as a cheaper alternative for tech workers and, although it acknowledged the high cost of housing, said various actions were under way to deal with the issue. Amazon now has 1,000 researchers and engineers in Vancouver. Last November, it announced it would add 1,000 workers at another downtown site set to open in 2020. Mr. Trudeau said there are many reasons why industry giants such as Amazon choose to settle and grow in Canada. “Our work force is highly educated, skilled and diverse. Folks across the country are ready to take on the jobs of tomorrow and help companies like yours shape the future,” he said. Mr. Robertson said Amazon’s decision to expand would add to the increase of innovation and tech jobs in Vancouver. “It’s not slowing down,” he told the gathering. Jill Tipping, president and CEO of the BC Tech Association, representing the industry in the province, said the announcement confirms that the province has the right mix of talent to create a sustainable tech ecosystem. In an interview, she said there are 100,000 British Columbians employed in the tech sector and another 50,000 working in tech jobs in other industries. Amazon launches international shopping from U.S.